Although general travel agents aren't needed as much anymore, destination-specific experts like Disney travel agents are still invaluable since they provide such detailed guidance on a specific place. 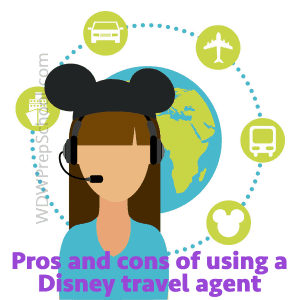 Unless people are willing to spend a lot of time reading and researching, we usually recommend they use a Disney World-focused agent to help plan trips. However, there are pros and cons to using a Disney travel agent. Here's a list to help you evaluate if using a travel agent is right for you. This seems obvious, right? But when it comes to Disney World (which requires more research than just about any other destination), it can be a huge time and stress savings to rely on an expert to help advise you on your trip plans. It doesn't cost you any extra to book through an agent vs. booking straight through Disney. Disney pays commission to the agency that books you but at no cost to you. Not only does it not cost you anything to use an agent, it can actually save you money because agents are aware of all new discount codes and will apply them to your reservation as they become available. Many of the super hard-to-get dining reservations require being online or on the phone at the crack of dawn 180 days in advance of your trip. Disney travel agents will make these reservations for you, allowing you to relax and sleep in. They will also make all of your FastPass+ reservations for your trip and special bookings such as Bibbidi Bobbidi Boutique as well. Good travel agents are able to help advocate for their clients in case things go wrong. Situations like issues with hotel rooms, illnesses during trips, items lost during a vacation, and many other things can pop up, and agents can super helpful in handling those for you. Overwhelmed by all of the details of planning a Disney World trip? Agents can put together plans for your trip so you'll know what to do when you get there. However, agent commissions are primarily made on hotel bookings so don't expect most agents to be willing to plan your itinerary unless they're also doing commissionable things for you as well. Travel agents can often get better deals on group bookings since negotiating with the supplier is something agencies can do. Control freaks may not be comfortable relying on somebody else to book their trip. However, you can do as much or as little as you'd like when working with an agent. Want to make your dining and FastPass+ reservations? You can do that. Just let your agent know what role you'd like to play. If you want to make changes to your reservation that was booked through an agent, you have to go through the agent to make those changes. You won't be able to call Disney to make modifications. Disney agents use Disney's systems to book your travel. That eliminates some options that might make more sense for your family - things like renting DVC points. If you decide to go with an agent, we recommend the handpicked team of Perfect Story Travel agents. You can fill out the quote request form on this site it'll go right to them. I’m a supercontrol freak and did all the planning for our first 5 Disney trips. Last two trips, I decided to use certain well known Disney travel agency because they had 30% off POFQ (which is rarely discounted) and deep 30-40% off Poly & BC. This was significantly better than any Disney discount for this time period. Also I got 10% off park tickets and a free water park passes. I didn’t really have to relinquish any control. I was emailed my Disney confirmation number, and my resort and tickets were automatically linked to MDE, so I could still make my dining ADRs and FP+ on my own. The only thing I had to depend on them for was to enter my room location request which I emailed to them and requested it be entered exactly as written. They only require one night room deposit on booking and cancelation policy is good with full refund of everything up to 5 days before checkin, lost deposit after that. This works well for us when we aren’t renting DVC points. I’m not sure how many other agencies are out there that offer deep discounts like this on resorts or tickets. What about help with the Hawaiian Disney Resort?? I travel for work and have travel rewards that I would like to use, would a Disney travel agent use my points that I was wanting to use for hotels or airfare? My husband and I are wanting to book a trip for September 2017. When should we reach out to a travel agent to start planning? Dining reservations can be made up to 180 days in advance. my answer is its never too early to start the magic! Everyone automatically gets a form that says the agency is legally obligated to offer insurance, but you are not required to choose it. You can check yes, no, or I would like more info. If you use an authorized Disney vacation planner, is it expected that you will tip them for their service? I know that Disney pays their commission but is a tip expected? It should be noted that not all Authorized Disney Vacation Planners are free for their services. Yes, Disney pays a commission however it’s the lowest commission of any travel company available to travel agents. For those looking for a Disney Specialist then start LOCAL. Check social media by typing in “Authorized Disney Vacation Planner + your location.” Then speak to the advisor. Any good advisor will require a phone conversation & possibly meet up. Travel agents aren’t online booking engines – it’s personalized service & expert advice. Disney is quite involved & ever changing. We are using someone at Small World Vacations, and she told me due to privacy laws and MDE, I am the only one who can make fastpass reservations. Is this true? If a client wants to give their agent the login info, most TAs will make FastPass+ reservations. It’s funny you mention that the agent will make hard to get reservations for you… Mine told me that i would have better luck making the reservations because i could access the system earlier than she could. For me that was the point of getting an agent. Next trip i’ll be planning myself! With all due respect, that’s just a bad agent. How do I find a “real” disney travel agent? Shannon, this is just the information I was looking for about a travel agency. I didn’t realize that there were Disney specified travel agents to help with things like Disney World. My husband and I want to take our kids to Disney World this year. This kind of travel agency could be beneficial to us. I was wondering if you could tell me if Small World Vacations is a good Disney Travel agency to work with? I’ve already booked rooms, but nothing else. Can the travel agent still help us out? You’ll have to transfer your reservation to her but she can still help you. Aside from dining reservations, agents will also make your reservations for special tours, things like Bibbidi Bobbidi Boutique and Magical Express. ALL travel agencies have to have a business license, follow the Seller of Travel laws, and have insurance. Hi. I’m just starting to plan a Disney vacation for April 2015 for 8 adults and 4 children. Do authorized Disney Vacation Planners also book air travel? Yes, they can book flights as long as you’re booking other things (like a hotel room) as well. So I am looking to do a Disney trip for about 10 people. I believe an agent will be my best bet. I need to get some advise on this please!!!!!!! Hi! I just read this amazing article as I am trying to persuade my mom to take me this summer 2014. I’m so set on getting my mom to take me to Walt Disney World as I am a major major major Disney fan. I even made a PowerPoint for her explaining in much detail why she should take me. This would be my irate time going, and I really want it to be a magical and special trip for me and my mom. I’m sixteen and I’ve been begging her to take me before I go off to college. She hasn’t said no yet, but I know that if she says yes, she won’t want to do all the planning as I know more info than she does from all the research I’ve done. I think my mom would like to work with a Disney travel agent if we do decide to go. Any recommendations??? 🙂 Thanks! Hi! I just read this amazing article as I am trying to persuade my mom to take me this summer 2014. I’m so set on getting my mom to take me to Walt Disney World as I am a major major major Disney fan. I even made a PowerPoint for her explaining in much detail why she should take me. This would be my first time going, and I really want it to be a magical and special trip for me and my mom. I’m sixteen and I’ve been begging her to take me before I go off to college. She hasn’t said no yet, but I know that if she says yes, she won’t want to do all the planning as I know more info than she does from all the research I’ve done. I think my mom would like to work with a Disney travel agent if we do decide to go. Any recommendations??? 🙂 Thanks! Hello. I am currently in the process of applying to work with an “authorized Disney vacation planner.” How do I know they are legit? An agent should never give you access to their agency/agent identification. With the information on that card anyone can book using those identifiers and create all kinds of havoc. I personally know agents who did this and had to go to court to recoup costs from fraud caused by shady people. You can verify an agency is registered and meets requirements by using either the CLIA or IATA websites. Both are considered the industry standard for registration. You can find her at http://www.disneyonmymind.com and http://www.facebook.com/magicalsteph. Thank you Shannon for passing along my information! It is my pleasure to spread the magic to anyone looking for stress-free vacation planning! I need a travel agent for our trip in two weeks. Any suggestions? Yep! The one in the right sidebar. Her name is Cheryl. These are beautifully valid points that you make. Before I became a ADTA I planned my own families vacation. The amount of research that can go into finding all the best deals can be very time consuming for the typical family who wants a great deal but doesn’t have the time to do all the research. I agree with Stephanie, I like to keep an eye out for additional deals for my clients after they have booked. A happy client is a return client!